In the UK, seventeen percent of people 16 and over cycle once a month or more. Those who want extreme thrills enjoy pedalling BMX bikes. 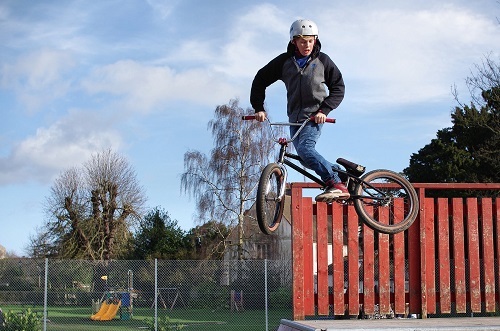 BMX bikes are used for racing and they are also used on park, dirt, vert, flatland and street surfaces. Today, it’s time to look at the most innovative and practical features of modern and sought-after BMX bikes. BMX technology has evolved, and finding a BMX bike with the latest, greatest features, such as tapered tubes, lighter and bigger tyres and plastic pegs will lead to a comfortable and exciting ride. Choosing a bike with the right features will also help you to get maximum ROI from your next BMX bike purchase. Tapered tubing is a hot trend in BMX manufacturing and design. Tubes are classified as tapered when their overall diameter gets smaller from one end to the other. These days, many seat stays and chain stays are made with tapered tubes. Tapered design allows for more clearance for tyres and gives BMX bikes a cleaner aesthetic. Tubes may be crafted from aluminium, steel or titanium tubing. Titanium is pricier, but it delivers plenty of advantages, including its light weight, durability, strength and damping. Titanium makes a bike more reactive to its rider. No matter what material you choose, you should go for tapered tubes. BMX tyres are important bike components. The way that your bike handles, looks and feels will be strongly impacted by its tyres. Lighter tyres are in demand and some BMX bike manufacturers are meeting demand by adding ultralight Kevlar bead casings with higher-than-average thread counts. Tyres on the best BMX bikes may be lighter, but they are also big in scale. Look for a bike with tyres measuring 2.3 inches in width or more. In the future, tubeless tyres may be a feature of BMX bicycles. For now, lightweight, big tyres with tubes are the best choices. A bigger front tire boosts traction, while a back tire that’s a bit smaller will reduce overall bike weight, but still help to cushion you from blows as you ride. If you want pegs that really slide (and help you to grind while you’re riding your BMX bike), you should invest in a model with plastic pegs. These pegs slide efficiently, without creating friction, and they are practically weightless. You’ll be a happier rider when your bike is equipped with these pegs. One big additional benefit of opting for plastic pegs is that they’re easy to replace when they get worn down. When you shop for a new BMX bike with tapered tubes, lighter and bigger tyres and plastic pegs, you’ll be able to get better results when you grind and stall. In some cases, it may be possible to make aftermarket changes to an existing BMX bike, so this is one option if you don’t want to buy a new ride. If you are ready to purchase a brand-new BMX bike, keep these tips in mind while you shop around. This entry was posted in BMX, Land Sports and tagged BMX, BMX Bike. Bookmark the permalink.